No Dime Design: What's hiding in YOUR closet? So does ANYONE remember this post from *cough* February *cough* when I picked up this craft closet? I told you I go it for FREE but what I didn't tell you in that post was that I drove through one of our worst snow storms and almost got involved in a multi-car pile-up that I couldn't see in time because the snow was SO THICK. Then when we got there the elderly lady told me to get out of my truck and she whipped in into her driveway herself because they thought I was taking too long. I was mortified of sliding in the snow and hitting their car. Slow and steady plus a big pickup doesn't really jive well with a foot of fresh now. Then, when we got out she whipped out the power tools and took this bad boy apart pretty much by herself! What an inspiring lady! Obviously I'm not so on top of it as she is because it's taken me 7 months to write up this post. In my defense the room we put it in has undergone 3 MAJOR changes in those 7 months and, in fact, it's not even in that room anymore! But those are posts for another day. It's in my living room! Kind of a strange place for it, I know, but sometimes you just have to work with what you've got. and all closed up it looks pretty unassuming. And what I've got is a LOT of craft storage! I'll admit that this is not everything. I have a closet in my daughters room that is full of Scentsy/Crafting/Velata supplies but this holds the stuff I use most often. You'll see most of my sewing stuff on the left and mostly scrapbooking stuff on the right. The sewing machine only comes down when I'm using it, being on the shelf keeps it up and out of the way for when I am scrapbooking. The top shelf holds all my papers and a few extra scrapbooks. Each side has 3 shelves. Some of them are empty to accommodate the things on the other side when they are closed. I have thought about using some command hooks to squeeze in a few more inches of storage. The drawer holds fabric and shelf holds sewing notions. The lazy susan holds scrapbooking and sewing supplies it goes back in the center when it's closed up. The holes were cut by a previous owner. I am waiting to find the perfect thing to cover them up. Maybe even a curtain? Since it is in a corner for now a curtain would allow the cords to go through and I could use the empty space behind it for storage! Hmmm... wheels are turning! So, spill it. What's hiding in your closet? 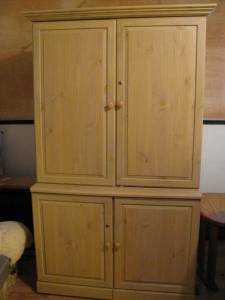 Who is the maker of the craft armoire? Was he built for that or for office? Great idea! Break Out the Fall Colors!